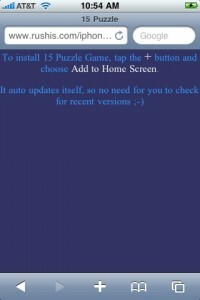 Here is my second game for Iphone 🙂 This is a classic 15 puzzle game, where the goal is to get the numbered tiles in a certain order in as few moves as possible. Hope you have a fun playing with it. 2. 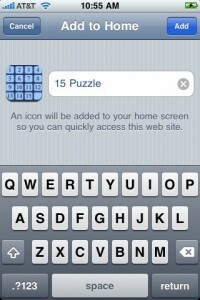 Tap the + icon on the browser, then tap on the “Add to Home Screen” button. 3. At this screen you can name the app, then click Add. You should see that the icon is now on your home screen.